PORTLAND, ME – U.S. 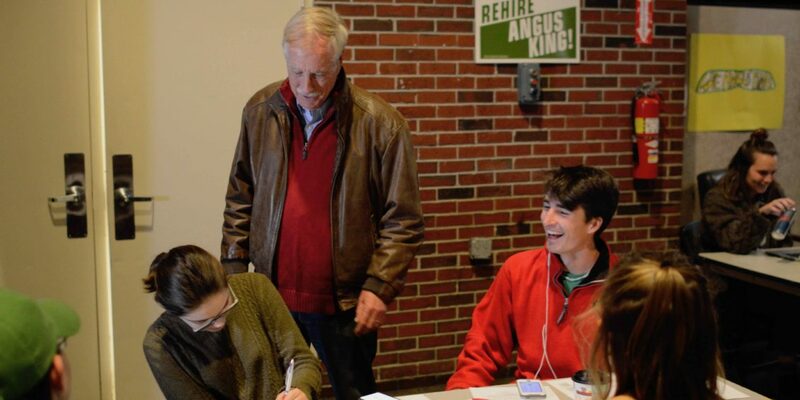 Senator Angus King (I-Maine) today joined campaign supporters in Portland during Get Out The Vote (GOTV). The four-day statewide event began Saturday with multiple phone banks and canvasses throughout Maine. Over 500 volunteers have signed up to participate in Get Out The Vote, and Senator King has joined them around state. Men and women of all ages from all parts of Maine have come out to show their support for Senator King, with almost 1,600 people signing up this year to volunteer with his campaign. Over 100 Democrats, Republicans, and independent community leaders from all 16 counties have signed on as Senator King’s State and County Chairs and are working to organize on his behalf in their respective regions. So far, the campaign has attended 18 state fairs and festivals, and Senator King has held over 100 house parties throughout the state. The campaign has three campaign offices in Brunswick, Bangor, and Auburn. The King campaign collected over 10,000 signatures from all sixteen counties to get Senator King’s name on the ballot, submitting to the Secretary of State many more than the required 4,000 signatures. During his first term as Senator, Angus King has worked to build a better future for Maine people. Senator King helped spearhead a bipartisan student loan deal that has saved Maine students over $250 million in interest rates. He worked across the aisle to pass a comprehensive bill to address the opioid crisis–which has affected every part of the State–leading amendments to help rural communities by allowing Nurse Practitioners and Physician Assistants to provide medication assisted treatment. He has made access to affordable healthcare a priority, and fought for jobs in Maine, pushing for a provision to include footwear in the Berry Amendment, ensuring U.S.-made athletic shoes for military recruits – and helping to secure a $17.3 million contract for New Balance factories in Maine. Senator King has made workforce development one of his top priorities and promoted the creation of a public-private partnership to grow and diversify Maine’s forest industry, resulting in an interagencyEconomic Development Assistance Team (EDAT), which will help grow Maine’s forest industry and rural economies. Finally, Senator King has worked to protect our national parks, introducing the Restore Our Parks Act, to address the maintenance backlog. Senator King knows there’s more work to be done, including lowering health care costs, and helping our veterans by expanding their options for care. He believes that we must continue to improve services so that Maine veterans can get the treatment they have earned, take a comprehensive approach to the opioid epidemic that focuses on prevention and treatment, and move Maine into the 21st Century with better infrastructure, including rural broadband. Senator King remains committed to working on these issues so we can build a better world for future generations. Photo: U.S. Senator Angus King (I-Maine) meets with supporters at a phone bank in Portland.